After the Minneapolis City Council got into a tiff with Wells Fargo, Fargo City Commissioner Dave Piepkorn announced an absurd plan to try to lure the bank’s Minneapolis operations to Fargo. The Minneapolis City Council is considering halting business with Wells Fargo over the bank’s funding of the Dakota Access Pipeline. 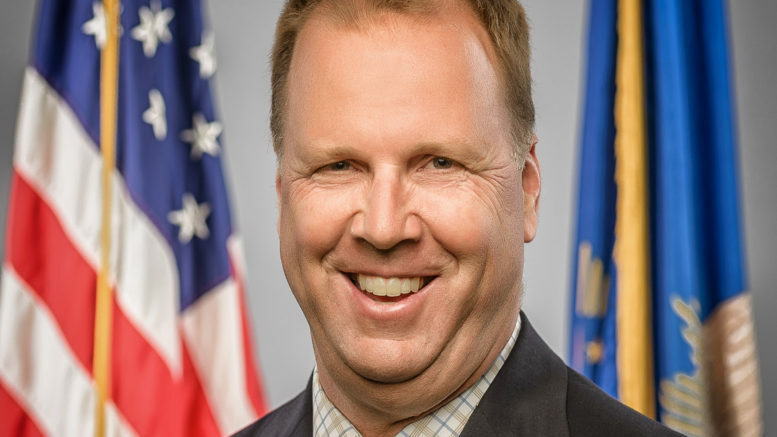 That’s left Dave Piepkorn, a Fargo city commissioner, trying to lure Wells Fargo’s Minneapolis hub to his prairie burg. In recent years, North Dakota has moved to the right of Mussolini, making it a receptive home to a bank that defrauds customers, screws Natives, and exacerbates climate change. 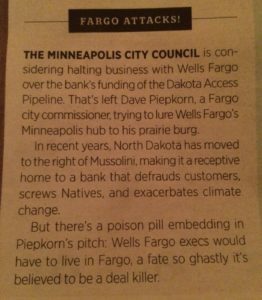 But there’s a poison pill embedding in Piepkorn’s pitch: Wells Fargo execs would have to live in Fargo, a fate so ghastly it’s believed to be a deal killer. Be the first to comment on "Minneapolis Paper Mocks Fargo Commissioner Piepkorn"